Botswana is a member of the African Union, the Southern African Development Community, the Commonwealth of Nations, and the United Nations. Despite its political stability and relative socioeconomic prosperity, the country is among the hardest hit by the HIV/AIDS epidemic, with around a quarter of the population estimated to be infected. In the 19th century, hostilities broke out between Tswana inhabitants of Botswana and Ndebele tribes who were making incursions into the territory from the north-east. Tensions also escalated with the Dutch Boer settlers from the Transvaal to the east. After appeals by the Batswana leaders Khama III, Bathoen and Sebele for assistance, the British Government put Bechuanaland under its protection on 31 March 1885. The northern territory remained under direct administration as the Bechuanaland Protectorate and is modern-day Botswana, while the southern territory became part of the Cape Colony and is now part of the northwest province of South Africa. The majority of Setswana-speaking people today live in South Africa. Bechuanaland Protectorate, Basutoland (now Lesotho) and Swaziland (the High Commission Territories) were not included, but provision was made for their later incorporation. However, their inhabitants began to be consulted by the UK, and although successive South African governments sought to have the territories transferred, the UK kept delaying; consequently, it never occurred. The election of the Nationalist government in 1948, which instituted apartheid, and South Africa’s withdrawal from the Commonwealth in 1961, ended any prospect of incorporation of the territories into South Africa. An expansion of British central authority and the evolution of tribal government resulted in the 1920 establishment of two advisory councils to represent both Africans and Europeans. Proclamations in 1934 regulated tribal rule and powers. A European-African advisory council was formed in 1951, and the 1961 constitution established a consultative legislative council. The presidency passed to the sitting Vice-President, Quett Masire, who was elected in his own right in 1984 and re-elected in 1989 and 1994. Masire retired from office in 1998, and was succeeded by Festus Mogae, who was elected in his own right in 1999 and re-elected in 2004. The presidency passed in 2008 to Ian Khama (son of the first President), who had been serving as Mogae’s Vice-President since resigning his position in 1998 as Commander of the Botswana Defence Force to take up this civilian role. A long-running dispute over the northern border with Namibia’s Caprivi Strip was the subject of a ruling by the International Court of Justice in December 1999, which ruled that Kasikili Island belongs to Botswana. 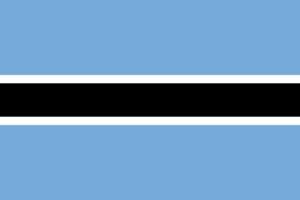 At 581,730 km2 (224,607 sq mi) Botswana is the world’s 48th-largest country. It is similar in size to Madagascar or France. It lies between latitudes 17° and 27°S, and longitudes 20° and 30°E. The country is predominantly flat, tending toward gently rolling tableland. Botswana is dominated by the Kalahari Desert, which covers up to 70% of its land surface. The Okavango Delta, one of the world’s largest inland deltas, is in the northwest. The Makgadikgadi Pan, a large salt pan, lies in the north. The Limpopo River Basin, the major landform of all of southern Africa, lies partly in Botswana, with the basins of its tributaries, the Notwane, Bonwapitse, Mahalapswe, Lotsane, Motloutse and the Shashe, located in the eastern part of the country. The Notwane provides water to the capital through the Gaborone Dam. The Chobe River lies to the north, providing a boundary between Botswana and Namibia’s Zambezi Region. The Chobe River meets with the Zambezi River at a place called Kazungula (meaning a small sausage tree, a point where Sebitwane and his Makololo tribe crossed the Zambezi into Zambia). Botswana faces two major environmental problems: drought and desertification. The desertification problems predominantly stem from the severe times of drought in the country. Three quarters of the country’s human and animal populations depend on groundwater due to drought. Groundwater use through deep borehole drilling has somewhat eased the effects of drought. Surface water is scarce in Botswana and less than 5% of the agriculture in the country is sustainable by rainfall. In the remaining 95% of the country, raising livestock is the primary source of rural income. Approximately 71% of the country’s land is used for communal grazing, which has been a major cause of the desertification and the accelerating soil erosion of the country. Since raising livestock has proven to be profitable for the people of Botswana, the land continues to be exploited. The animal populations have continued to dramatically increase. From 1966 to 1991 the livestock population has increased from 1.7 million to 5.5 million. Similarly, the human population has increased from 574,000 in 1971 to 1.5 million in 1995, nearly a 200% increase. “Over 50% of all households in Botswana own cattle, which is currently the largest single source of rural income.” “Rangeland degradation or desertification is regarded as the reduction in land productivity as a result of overstocking and overgrazing or as a result of veld product gathering for commercial use. Degradation is exacerbated by the effects of drought and climate change.” Environmentalists report that the Okavango Delta is drying up due to the increased grazing of livestock. The Okavango Delta is one of the major semi-forested wetlands in Botswana and one of the largest inland deltas in the world; it is a crucial ecosystem to the survival of many animals. The Department of Forestry and Range Resources has already begun to implement a project to reintroduce indigenous vegetation into communities in Kgalagadi South, Kweneng North and Boteti. Reintroduction of indigenous vegetation will help with the degradation of the land. The United States Government has also entered into an agreement with Botswana, giving them $7 million US dollars to reduce Botswana’s debt by $8.3 million US dollars. The stipulation of the US reducing Botswana’s debt is that Botswana will focus on more extensive conservation of the land. The United Nations Development Programme claims that poverty is a major problem behind the overexploitation of resources, including land, in Botswana. To help change this the UNDP joined in with a project started in the southern community of Struizendam in Botswana. The purpose of the project is to draw from “indigenous knowledge and traditional land management systems”. The leaders of this movement are supposed to be the people in the community, to draw them in, in turn increasing their possibilities to earn an income and thus decreasing poverty. The UNDP also stated that the government has to effectively implement policies to allow people to manage their own local resources and are giving the government information to help with policy development.